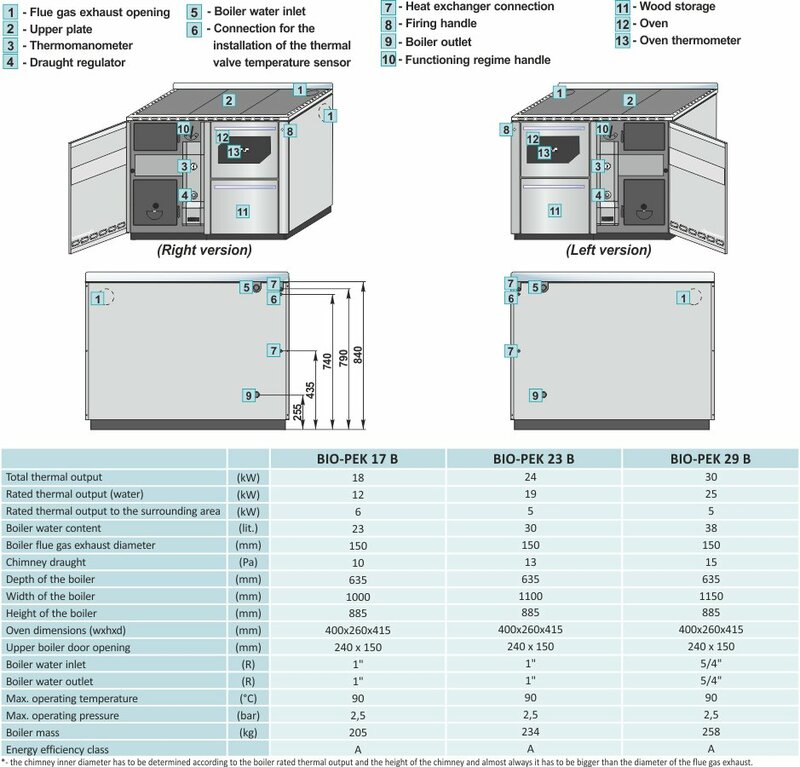 BIO-PEK B steel hot water boilers for solid fuel firing are engineered for heating of smaller premises and for cooking and baking. Heat output transferred to heating water is 12, 19 and 25 kW, and 5-6 kW is transferred to the surrounding space through the upper heating plate. There is the option of a boiler with right or left connection to the chimney. If the heating output is sufficient, the boiler can produce the heating energy for more than a single floor. They can be connected to closed and open central heating systems, with and without the accumulation tank. The boiler is easily adapted to requirements for space heating by changing the position of the firebox grate. Modern design and dimensions in line with normal furniture standards enable integration into a kitchen space, as well as into any other room inside a house, that has a direct connection to a chimney. Boilers are manufactured to the EN 12815 standards and in accordance with ISO 9001 and ISO 14001. By installing ak. CAS / -B / -S / -BS allows easy cooking throughout the year. Hot water boilers for central heating systems, cooking and baking, that are produced for solid fuel firing. Further heating is produced from the upper plate which warms up the room. An appropriately sized combustion chamber and a number of flue gas passes enable high performance temperature exchange and cooking on its upper plate, as well as baking in the oven. 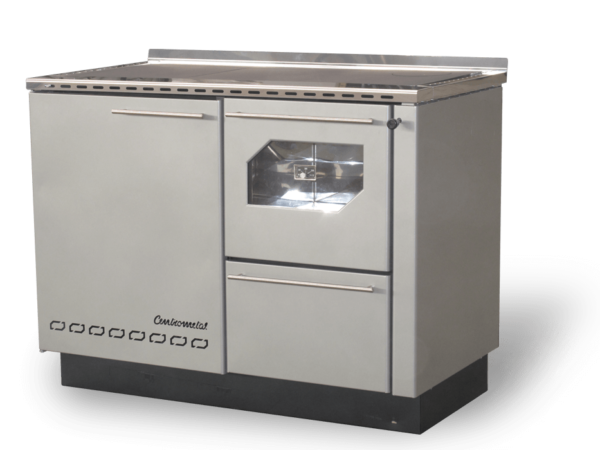 The option of changing the position of the firebox grate by an integrated mechanism enables cooking and baking all year round. The wide oven permits the use of standard dishes. Fire-proof glass and a thermometer on the oven door enables checking of food in the oven. Standard delivery includes the heat exchanger and connection to the thermal valve which enables the installation also to closed central heating systems. The big door enables firing with large pieces (33cm long) of solid fuel, as well as easy cleaning and maintenance. The circulation pump of the central heating system is controlled by a factory fitted thermostat. Boilers can be connected to the chimney at the rear, lateral or top right side of the boiler – the right design or the rear, lateral or top left side of the boiler – left design. Standard delivery includes also the draught regulator and thermomanometer. Economical in use and ecologically acceptable. Integrated accumulation tank CAS/-B/-S/-BS enables easy cooking all year round.